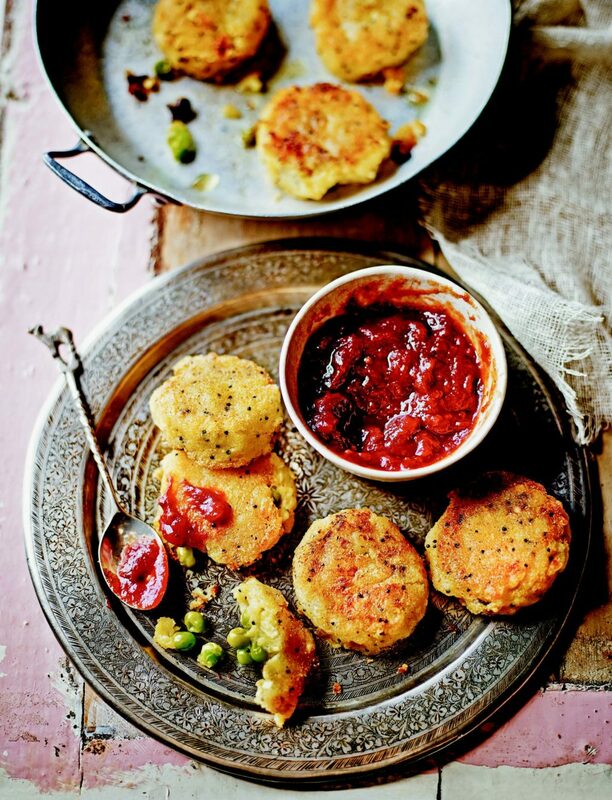 This is a recipe for traditional Indian potato cakes—mashed potatoes delicately spiced and filled with peas and then pan-fried until golden and crispy. They are often served with chutneys, so rummage through the pantry and get some of your favorites out. I prefer to stuff the mash with peas, but you can stir them through if you like. It’s worth rolling them in semolina to get them really crispy, but they still taste great without. Fill a saucepan with cold water, add the potatoes with the turmeric, a few large pieces of lemon zest and a good pinch of salt and bring to a boil. Cook for about 15 minutes, or until the potatoes are soft. Drain the potatoes and leave to steam and dry out in the colander while you temper the spices and the holy trinity of garlic, ginger and chile. Gently heat 1 tablespoon of the oil in a skillet and add the mustard seeds. When they start to jump out of the pan, stir through the garlic, ginger and chile powder. Transfer the potatoes to a bowl and pour the tempered spices over the top. Add a good pinch of salt, squeeze over the lemon juice and stir in the cilantro. Taste and add more chile powder if you like it fiery. Using a fork, mash the potatoes and spread them out so that they cool quickly. When they are cool enough to handle, start making the tikkis by putting about a tablespoonful of mash in your hand and flattening it out. Get about a teaspoonful of the blanched peas and put them in the center. Wrap the mashed potatoes around them as if the peas were a stuffing. Flatten it slightly, making sure the peas don’t push their way through. Continue to make tikkis until you have used up all the mash and peas. Preheat the oven to 200°F. Gently heat the remaining oil in a large skillet. Roll the tikkis in the semolina and fry, in batches, on all sides until golden and crispy. Keep the cooked ones warm in the oven while you fry the rest. Serve with your favorite chutney such as tomato chutney. Reprinted from The Indian Family Kitchen: Classic Dishes for a New Generation. Copyright © 2015 by Octopus Publishing Group Ltd. Published in the United States by Clarkson Potter/Publishers, an imprint of Penguin Random House LLC.